It's no secret that one major part of owning a business is using creative retail display ideas on your display racks and storefront to catch the customer's eye and relay relevant information. And while there are virtually countless options for sign types and materials, many offer benefits such as more versatility, better durability, and a variety of other factors. One type of sign that many medium and large businesses are turning to is the retracting ceiling banner. These signs are banners that attach to the ceiling and can be retracted at the owner's convenience offer a variety of innovative benefits -- here are just a few. Many business owners neglect to think about safety when considering what types of signs best suit their company. Other signs designed to be hung from higher altitudes require a ladder to set up and take down. Using ladders in the workplace should be avoided when at all possible, since most employees don't have the proper training. Whether an employee falls from a ladder or is caught underneath one, the risks are nearly limitless. Eliminate your business' risk of a workplace injury by investing in high quality retractable banners to hang from your vaulted ceilings. They're made to last and can be retracted with ease, reducing your business' need for using ladders. Many types of retail signs can be missed by the consumer even if they're displayed at eye level. This is particularly common for glass door signs. This happens because the consumer was distracted, or more commonly, the sign wasn't designed with the consumer in mind. It had too much text or was simply too boring. Using retractable banners to advertise the best qualities of your store is more likely to be seen by the easily distracted consumer. 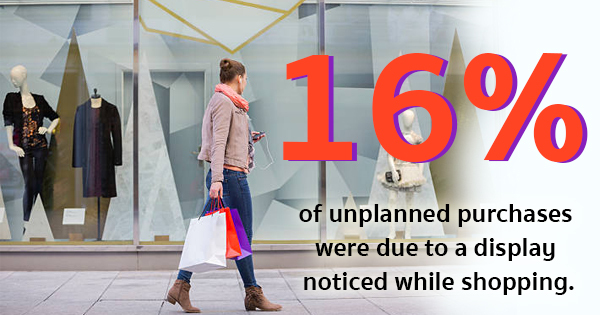 According to a 2014 Mass Merchant Study, 16% of unplanned purchases were made due to a display noticed while shopping. With that in mind, a well-designed and properly-placed retractable ceiling banner could be exactly what your business needs to boost sales and make deals more visible. Ultimately, investing in a retractable ceiling banner display is a great way to reach more customers and make more sales. They also save money on plastic and metal sign stands, which many other sign types require. For more information about metal sign stands or retail displays, contact our experts at The Global Display Solution.